Can You Ease Migraine Pain With a Cool Hat? I never know when a migraine will strike, but I do know that when it happens there will be at least two days of intense suffering — maybe more. Daily demands of family and work do not stop because I am in pain. In fact, they tend to make it worse. For example, my drive to work is an hour commute — on a good day. My office is in an old mill building, so the windows are large and the room is always bright, even on a cloudy day. None of this helps migraine, but I know that all us migraine sufferers have times that we must simply push through and keep going. So, I usually end up with several days of pain, nausea and agony to deal with within each month. This pain makes me willing to try just about anything that might offer some relief and let me get through those demanding, tough days — even something unusual. Icing my migraine has always helped me. I often use icepacks, applied to my neck or head, and they usually ease the intensity — but they are hard to use unless you are lying still. In other words, not for driving or sitting at my desk. But, I got my hands on an amazing invention to try that actually provided me tremendous relief. It’s a hat that holds ice packs and can include the benefit of applied pressure to key spots on the head with the icy-cool relief. It’s called the Migraine Hat. The hat essentially wraps round the head, and has adjustable Velcro closures to make the pressure exactly what you want it to be. The top is just a soft matching piece of cloth that folds over the top of your head to make it really look like a hat. Made of soft fleece material, there are pockets within the hat where you place frozen gel packs — which come with the hat. This means no moisture or leaking from ice and it remains flexible when frozen for maximal comfort and coverage. 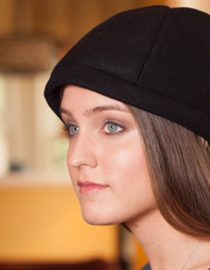 The Migraine Hat combines several proven methods to reduce migraine pain. Cooling therapy, also called cryotherapy, pressure therapy to treat the most painful migraine symptoms, and the ability to block out light and sound if you choose to pull it down over your eyes and ears. Cryotherapy involves cold temperatures applied for relief of swelling and pain to the body, which essentially removes heat from a specific part of the body causing the pain. It is believed that during a migraine, the blood vessels inside the head dilate too much, causing pain. These vessels become swollen with blood, which puts pressure on the nerves surrounding the vessels. Both heat and cooling therapies are often used as temperature manipulation to reduce migraine/headache pain. The use of cold therapy is believed to cause the swollen blood vessels to constrict back to near normal size, which in turn, reduces the pressure and pain level of the migraine or headache pain. The Migraine Hat worked well applying pressure just where it was needed. I felt tremendous relief from the pain with the pressure it provided and I was able to accomplish this hands-free. I drove, I worked, I helped my kids with homework and I made dinner. The hat did all the work for me. The entire cap sits on the head like a winter hat would, and the ice hits the crucial areas where cold compresses are needed during a migraine. It completely solved the issue of mobility and an icepack constantly sliding off my head, allowing me to drive and to wear it at my desk. I got a few odd looks from co-workers, but they all know I get bad migraines and some of them suffer from them too. So, once I explained the hat, nobody gave it a second thought. I have not worn the Migraine Hat in the summer yet — I just got it. I am sure wearing a winter-looking hat in July will stand out while I am driving in the car, but honestly, who cares? It made my migraine attack much less painful. It helped me get through a bad migraine and continue with my work and family obligations. I could not ask for more — except maybe no more migraines. Image courtesy of The Daily Migraine. These natural remedies for migraine have helped me manage my migraine symptoms while also improving my mental health and sleeping habits.